Very pleased with all aspects! [...] This mirror does shake a litte, but they all do, and it is very light. Objects are closer than they appear, but the wide field of view is very helpful. I still use a helmet mirror to see what is really close, but this mirror warns me of arriving rear traffic long before I detect it in my helmet mirror. You can't have too many mirrors if you ride in traffic! Easy to install and adjust. Mirror was used on Nashbar trekking bars as other mirrors did not work. Mirror is not as clear as the Mirrycle round mirror, possibly due to the convex shape. Overall, I have gotten use to the ok clarity as I need a mirror for my commutting needs. Stays steady with clear view. My safety is more assured. I am an eye doctor who feels it makes good sense to use a mirror on his road bike. I position this mirror just below my left brake hood. This mirror is extremely light weight and compact, yet still has an excellent field of view. Compared to other mirrors, the optics are superior. Although it can be hard to find, this is my 3rd mirror in this model. I'm a gear guy and compared to the other 6 mirrors I've tried, this is the best. 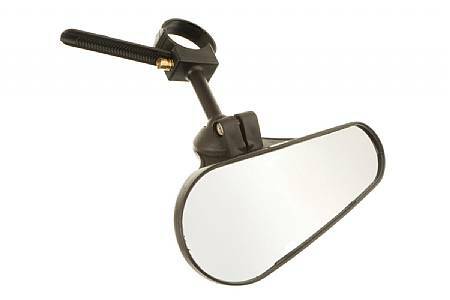 Best roadbike mirror, just the right size,many possible locations, sturdy,easy to install and adjust,great visibility for it's size. Installed on my De Vinci Leo road bike, looks great, affords good visibilty, enough to feel safe on roads. Very flexible as far as options on where one prefers to have it, easy to adjust, stays in place, very little vibration, good wide angle of view. Best mirror i've found for a road bike actualy looks made for racing. Well made mirror. Solid mounting on handlebars steady viewing field. Wide angle of view from convex surface. Very pleased with this mirror. I have the mirror mounted on the left side of the handlebar of my recumbent. It gives an excellent field of view so that I can even see back over my right shoulder. With a solid mounting it gives a vibration free rear view yet I can still make minor adjustments as needed. There are two screws, one to tighten the clamp on the handlebars and one to tighten the point where the mirror swivels within the mount. Light. Well made. Not fancy. Solid value. Although not absolutely needed becasue fo the wide field of view, it would be nice if they made a version that could be mounted on the right hand side of the handlebar as well. Well made,best I've used,easy installation. Ride every day, paved country roads, gives me good view from shoulder of road, easy to install, only had to readjust after first ride to improve side vision, very little vibration,gives a heads up to oncoming traffic, very reassuring. Can choose many possibilty of location, out of way and compact. A 10 plus,would recommend to all roadbikers. Best mirror I have used. depending on handlebar type, riding position, and other items (lights, bells, shifters, bags) it may be difficult to find a good mounting position for best viewing. A mirror that mounts off the end of the handle bar may be better for some.